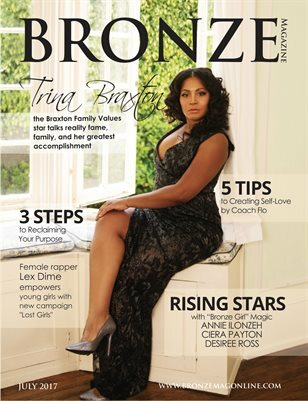 The lovely Trina Braxton of the reality hit TV series, Braxton Family Values is our cover star for this issue edition. Trina is a veteran in the music business, and it is such an honor to have her featured. In our intimate interview with her she talks about growing up in a family filled with strong women, the family’s reality series, her business ventures and her greatest accomplishment of all, being a mother. Other great features include three rising actresses who you need to know about: Annie Ilonzeh (All Eyez on Me), Ciera Payton (General Hospital, Ballers), and Desiree Ross (Greenleaf). Adding to all this inspiration is female rapper Lex Dime, who has a powerful new campaign called Lost Girls, where she encourages young girls to love and respect themselves. And speaking of self-love and self-respect, we have several articles that help to improve your body, mind, and spirit.